Toddler Mommy & Me Paint and Plant for Mother’s Day | Eat. Paint. Love. - The number of separate event datetimes (see table below) that this ticket can be used to gain admittance to. Admission is always one person per ticket. For the Mommas + The Itty Bitty Kids. The perfect Mother’s Day Gift! Quality, creative time with a make and take to last for yours to come! Supplies and Instruction included. 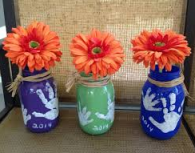 Each mom and child pair will receive ONE jar to paint & plant while they are in the studio! 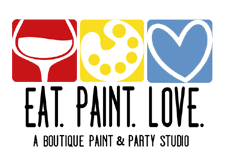 Beer + Wine + Soft Drinks are available in the Studio for additional purchase. Seats must be reserved ahead of time by registering and paying on our website. No EXPERIENCE NECESSARY. Any age can attend but will be an adult atmosphere. Must be 21 years or older to drink. We will provide you with everything you need from supplies to instruction + LOTS OF FUN! We have a plenty of street parking on Main Street. We are located diagonally across the street from Rite Aid with several lots in walking distance. WE DO NOT ISSUE REFUND UNDER ANY CIRCUMSTANCE. If you register for a session and can not attend after all, you may use your registration for up to 30 days from your event. Just e-mail us and let us know when you’d like to use it. Anyone whom is 15 minutes late or after should plan to re-schedule for a different session.